Modern mechatronic systems consist of numerous precision components that must be assembled in complex configurations. Here, every detail counts. 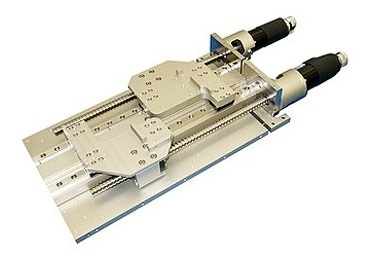 Steinmeyer Mechatronik, a division of August Steinmeyer GmbH, offers design and assembly of custom linear mechanisms for precision positioning systems for a variety of demanding applications. We have deep experience in medical devices, laboratory instrumentation, optical inspection & semiconductor positioning. Our engineers can implement your finished design or optimize your concept. A customer came to us with a challenge. Two lenses must be precisely positioned both absolutely and relative to each other. Since the unit is exposed to stray radiation, lubrication must withstand these conditions for the long term. The basic solution consists of two sliding axes on a common guide system. Two moving sliding carriages have three carriages each, which allows them to move partially within each other to bring the lenses together as closely as possible. Each drive mechanism consists of a precision ball screw and a direct current motor with a rotary encoder. The motor encoder assembly is designed to be interchangeable for easy maintenance.